One criterion to measure the efficiency of an injection moulding machine is the number of moulded parts produced per time unit. Consequently, the stoppages of the processing machine must be reduced as much as possible to achieve maximum efficiency. Robots influence the efficiency by the time taken for parts removal, the mould open time. WITTMANN robots equipped with R8 and R9 control systems have some special functions as standard, which substantially shorten the removal time. It is clear that a robot should reduce as much as possible the time it takes to remove injection moulded parts. However, programming such time-optimised processes is not always so simple. Especially users with little or no experience can quickly reach their limits when it comes to laying down the most efficient sequence of program steps. WITTMANN is aware of this problem and offers effective tools to solve it. The WITTMANN robot control systems R8 and R9 provide the command SmartRemoval IN as a prerequisite for every highly efficient parts removal process. This command is based on a process of machine signal analysis patented by WITTMANN. It calculates the relationship between the time taken by the injection moulding machine to open the mould and the traveling and acceleration characteristics of the robot. This functions automatically in the background without operator intervention. SmartRemoval IN thus offers the advantage that the robot already starts to accelerate its vertical axis before the moving mold half has reached its end position. In this way, several valuable tenths of a second can be saved, since the acceleration phase takes relatively long compared to the distance to be covered. By having the accelerated movement carried out parallel to mold opening, any negative effect resulting from the robot’s inertia can be eliminated. In combination with an early command release (e.g. the release for ejector movement), total time savings of about 30% can be achieved. To facilitate the operation of SmartRemoval, the command sequence is visualised to the operator by a simple chart. SmartRemoval IN demonstrates its strength by automatic selection of the optimal travel sequence adapted to each individual application in producing a great variety of parts. Mould opening synchronisation is available as standard for every WITTMANN robot which is fully integrated in the machine’s control system. In the case of moulded parts with deep cavities (such as waste bins or flower pots with filling volumes of more than 20 l), this function can provide a major savings potential. For here it is already possible to pull out the parts while the mould opening movement is still in progress. In this way, the connection between the gripper and the part can be established earlier. 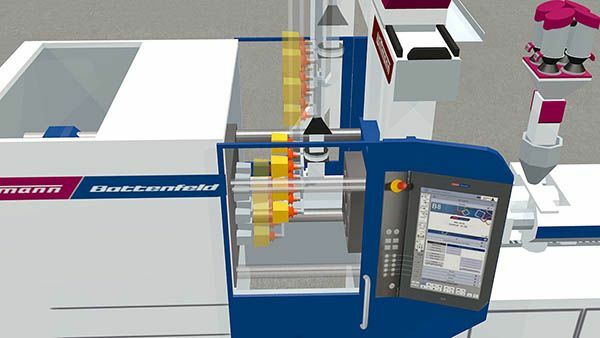 This enables savings in terms of the injection moulding machine‘s opening stroke as well as in mould open time. Regardless of the type of travel attributes selected, programming the demoulding sequence with SmartRemoval OUT is always possible. SmartRemoval OUT functions in combination with an early “close mould” command release and is based on effective response to signals. This includes the choice of optimal timing when the signal to release the “close mould” command is given. SmartRemoval OUT offers the possibility to transmit this command to the injection moulding machine before the mould protection sensor is reached. This eliminates delays in signal transmission. The injection moulding machine starts the closing process precisely on passing the mould protection sensor. This avoids the delays which result from the traditional timing of the release only after the sensor has been passed. To counteract the risk of losing the moulded part in this highly optimised demoulding process, SmartRemoval OUT is closely linked to the iVac system included as standard. iVac from WITTMANN offers the advantage that the moulded part can already be gripped with a fraction of the necessary vacuum pressure, and thus the removal sequence can be started. In the course of the retraction movement, the vacuum pressure rises to the maximum level. Once the set reference pressure for the moulded part has been reached, the signal for the release of the “close mould” command is given. This release can already take place several tenths of a second before the part leaves the mould area. In this way, signal delays at the interface between the robot and the injection moulding machine are compensated, and the mould open time is minimised. The combination of SmartRemoval with iVac optimises the mould open time regardless of the type of robot interface (Integration, E67, E12). Compared to applications without such a functionality, the time savings potential lies at about 30%. For all WITTMANN servo robots equipped with the control system versions R8 and R9, the functions described above are available as standard. “We believe that the removal time is the most important criterion for measuring the performance of a robot system. Consequently we already created the strong duo of SmartRemoval and iVac several years ago in order to act with maximum efficiency at this point”, says Martin Stammhammer, International Sales Manager Robots and Automation Systems of the WITTMANN Group.